1LMNOLA » 2Sports » 3WATCH Laker Fan Hit Improbable Half Court Shot For $95,000!! Jan 3rd was a great day for this lucky Laker fan. While the Los Angeles Laker players were huddling around their bench and not paying attention to the stubby fan that usually misses the half court heave. The Lakers notice the shot went in as the crowd went wild when the man hits the perfect shot! 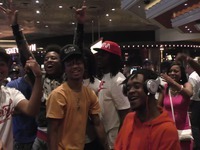 Watch as the Laker players congratulate the pumped up guy who just won $95K from MGM Grand.